Booming economy, emergence of affluent middle class and increased exposure to international brands has today brought a revolution in the retail segment. With lesser time at disposal, today's consumer wishes to integrate shopping, leisure & fun in a single-family outing. Rishabh IPEX Mall is our answer to needs of the changing market scenario. Creation of a quality shopping and leisure venue that fulfills the needs and lifestyle aspirations of people and provides retailer's the right kind of infrastructure & environment, is the vision of Rishabh IPEX Mall. To satiate the taste buds of connoisseurs of find food, a food court has been envisaged. With multi cuisine restaurants, fast- food outlets, it is the place to visit for a relaxing dining experience. At Rishabh IPEX Mall with its meticulous and scientific planning each and every aspect has been carefully taken of. There will be a plethora of recreational and playing zones to ensure that there is something interesting for every member of the family. At Rishabh IPEX Mall, special attention has been given to the tiny toddlers. A special kids zone with latest play equipment is envisaged to take care of the little ones, while the parent move around happily and spend quality time in the mall. Flooring inside shops will be of vitrified tiles. The building will have 100% power backup, provision will be made for 1 k.w. per 100 Sq.Ft. of carpet area. Shop frontage shall have aluminium glazing and doors with clear glass. Multi-Level circulation in mall through Escalators. Digital music in the main atrium. Electrical systems & DG sets for uninterrupted power supply with intelligent PLC based systems. Facade lighting with energy saving lamps is designed to give the whole exterior & interior a vibrant cool environment. Integrated building management system centralizes building operations, including fire alarm systems. CCTV cameras shall be installed at suitable location and all entries of the building. The monitoring shall be done in the control room. Provision of a two pair telephone line in each shop. 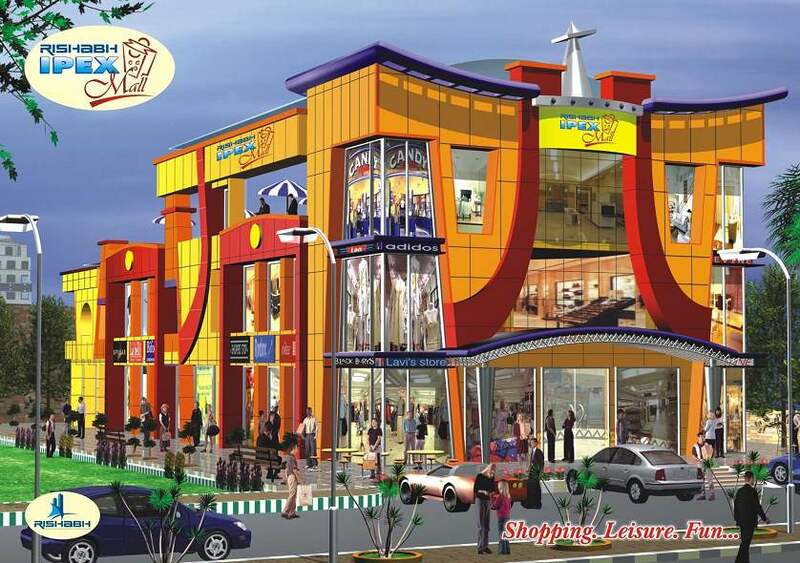 Rishabh IPEX Mall has been conceived at a strategic location in Patparganj, (Adjoining Vidyut Nikunj society). The mall, situated at 200Ft. wide main road of patparganj, has a huge potential neighbourhood of hundreds of affluent housing societies. Lack of lifestyle destinations in its vicinity ensures repeat visits by a captive catchment. The place is going to be buzzing with activity, as it is going to be the star attraction for the people of Patparganj Housing societies, Institutional and Industrial area and posh colonies of East Delhi.